This is the fourth post in the Local Luxury Dinner Party series. The party was part of the Next Food Blog Star competition hosted by Foodbuzz. While I didn't advance in the competition, the party was still fabulous! The main course for our Local Luxury Dinner Party was inspired by the deliciously simple meal I enjoyed during restaurant week at Sportello. Barbara Lynch’s casual spot served up sirloin with local potatoes and salsa verde. I was in luck; during my shopping trip to the farmers market Stillman’s at the Turkey Farm had NY strip steak. I picked up three steaks – enough for reasonably sized portions for four diners. Atlas Farm had some freshly dug early season potatoes and hard neck garlic. The challenge prompt for the dinner party was “new and exotic tastes” which meant thinking of a unique vegetable for the side. Something green caught my eye at Atlas and I knew it fit the bill! I picked up two heads of Broccoli Romanesco and headed home with my purchases. Because this was the third course in the meal, I either needed to cook it all ahead of time or have it all ready to cook while we ate the first two courses. To make things easy I left the potatoes unpeeled and the garlic cloves whole. Because the romanesco looks so stunning whole, that saved some prep time too. As you could see in a photo in the previous antipasti course post, I cooked the steak on the stovetop while the first course was being enjoyed. That gave me time to let the steak rest before slicing. The romanesco steamed while we ate the ravioli. Roasting the potatoes was the easiest part of the meal! I threw the washed and halved potatoes into a baking dish along with the garlic cloves. All they needed was quick toss with olive oil and a little salt. The potatoes went into the oven when the guests arrived and were perfectly roasted when it was time to serve the main course. To top the steak, I made lime basil butter the night before the party. I harvested the last of my lime basil, finely chopped it and mixed it with unsalted butter. This gave the steak a nice bright flavor component. With all this photography, the camera battery died right when started this course! We plugged in the battery and switched over to the phone camera for a picture of the completed plate. The wine paired deliciously with this course (really, the whole meal). The course was simple, light (for steak & potatoes), and didn’t fill us up completely. Close, but we still had a little room for dessert. Stay tuned for the next post: dessert! I can’t remember exactly how I made this! Here’s a general overview. I steamed this in my vegetable steaming pot until just softened. I topped it with a sprinkle of kosher salt and a swirl of extra virgin olive oil. I tried lime basil for the first time this year and it was fabulous! I can imagine how awesome the citrusy-herby flavor must be in your compound butter! This looks awesome, that steak looks like it would just melt in your mouth! I also like the lime/basil butter combo. Bet it really brought out all those great flavors! This was all delicious! Thanks for much for the invite! I haven't seen that kind of Broccoli since then....they don't have it at any sort of normal grocery store. I've had my eye out! I love the look of broccoli romanesco. I saw it at the market last week, but already had snagged too much produce to rationalize purchasing this as well. Does it taste much different than regular broccoli? Michelle - The lime basil was a great addition to my herb garden this year. Really easy to grow/keep harvesting. 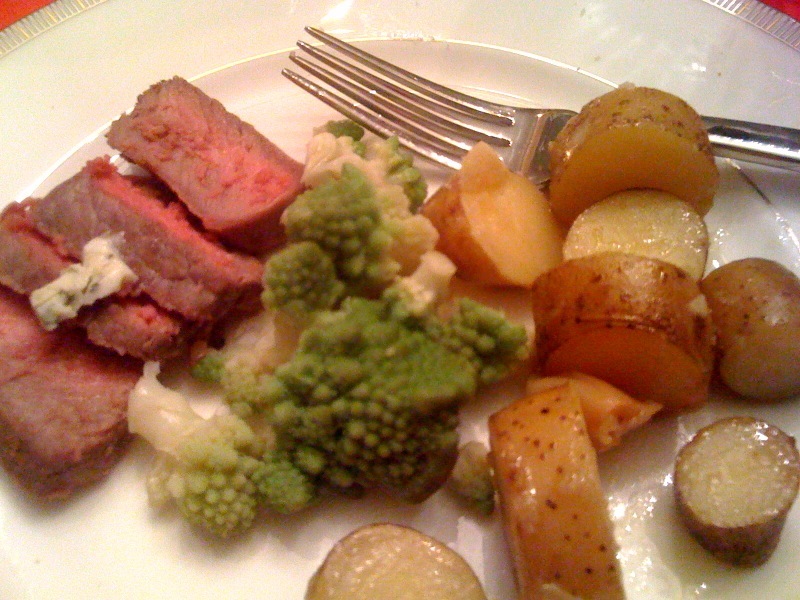 Alicia - hard to describe, it has a less strong broccoli taste and its texture is closer to a cauliflower texture than regular broccoli (no little green things flying everywhere when you cut it).